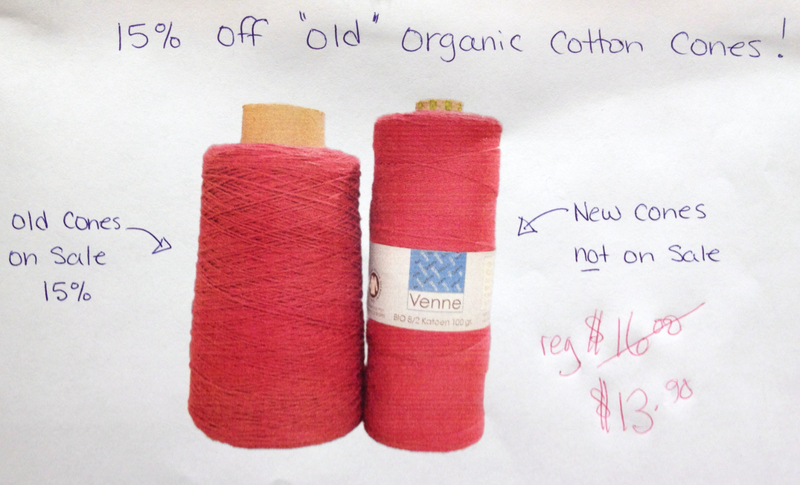 We are having a 15% sale on all cottolin and 8/2 organic cotton that’s wound on old-style cones. That’s right, 15% off the full price! But remember stocks are limited! Once those old-style cones have gone there will be no more old-style cone cottolin or old-style cone 8/2 organic cotton. You can identify the old-style cones by referring to the graphic above, which was created at great expense by one of the largest marketing agencies this side of The Rockies. Of course, all cottolin colours and all 8/2 organic cotton colours will continue to be available on new-style reels at the normal price but that won’t win any points in Marketing 101. On a more serious note this is your opportunity to try out organic cotton. You won’t believe how soft it is! Most of the world’s cotton is grown in the world’s poorest countries where farmers work unprotected with nasty herbicides and pesticides that not only endanger the workers but pollute their drinking water and pollute the planet. Last time our survey asked, “What do you like to weave?” Some pointed out that it was far too simplistic a question and that it didn’t take into account how multi-faceted weaving can be, to which I can only say, “I’m sworry”. Putting on my statistical analysis hat I can say authoritatively that weaving rugs is almost twice as popular as weaving lingerie. Knowing this information will definitely help shape the future direction of Jane Stafford Textiles. Season 2 Episode 5 – More on Fibonacci is now available to Online Guild members. I’m super-excited that this is the first episode with closed captions, hopefully this will be beneficial for the hard of hearing, non-native English speakers and those who struggle with my broad Thunder Bay drawl. Please let me know in the episode comments whether you find this helpful. After much anticipation, the Erica 50 table loom is now in stock. This thing is so stylish that you could stick a hat on it and call it George Clooney. Rep Weaving – what is the best loom and best techniques for successful table linens and more.